Origin & Soil: vineyards in the area of Barbaresco, Treiso, Alba and Serralunga. Formed originally by strong marine currents in the Miocene era,and composed of sand and clay. Taste: Lively, ruby red in colour with violet reflexes. On the nose, vinous, rich in fruit and flower aromas. On the palate, full and harmonic. Being so round and pleasant, it is a very versatile wine and a perfect match for a wide variety of dishes antipasti to meat and cheeses. Ideal serving temperature 16°C. Climate Vintage: After a winter with rigid temperatures and precipitations in the norm a spring without late is frosted continuation, with a warm climate moderated and some rain. June in then the temperatures, also in some periods to of over of the average they ages, has helped the plant in the various ones makes themselves phoenological. This climatic situation has been extended until the grape harvest with temperatures in the norm, fresh nights much in August and some thunderstorm that restored the water reservoirs of the ground, favouring an ideal maturation of the more premature grapes. The grape harvest is begun the 11th of September. Vinification: The grapes arrived in the cellars in a good state, ripe and with a healthy skin. They were destemmed and crushed. Alcoholic fermentation lasted 8 days at a maximun temperature of 28°C. The malolactic fermentation was completed before the end of winter. Ageing in 100 Hl oak barrels lasted for 8 months. Another 4 months of bottle ageing followed in the Prunotto cellars before release. "Vinous Antonio Galloni" has rated the wine "Prunotto Barbera d'Alba, Piedmont, Italy" from the vintage 2012 on 01.11.2013 with 89 of 100 points. "Vinous Antonio Galloni" has rated the wine "Prunotto Barbera d'Alba, Piedmont, Italy" from the vintage 2009 on 01.11.2011 with 89 of 100 points. "Wine Enthusiast" has rated the wine "Prunotto Barbera d'Alba, Piedmont, Italy" from the vintage 2008 on 12.01.2010 with 87 of 100 points. "Vinous Antonio Galloni" has rated the wine "Prunotto Barbera d'Alba, Piedmont, Italy" from the vintage 2007 on 01.11.2009 with 90 of 100 points. "Vinum Wine Magazine" has rated the wine "Prunotto Barbera d'Alba, Piedmont, Italy" from the vintage 1998 on 01.03.2000 with 15 of 20 points. "Wine Spectator" has rated the wine "Prunotto Barbera d'Alba, Piedmont, Italy" from the vintage 1993 on 31.10.1996 with 77 of 100 points. "Stephen Tanzer" has rated the wine "Prunotto Barbera d'Alba, Piedmont, Italy" from the vintage 2007 with 90 of 100 points. "Stephen Tanzer" has rated the wine "Prunotto Barbera d'Alba, Piedmont, Italy" from the vintage 2008 with 89 of 100 points. "Stephen Tanzer" has rated the wine "Prunotto Barbera d'Alba, Piedmont, Italy" from the vintage 2009 with 89 of 100 points. "Stephen Tanzer" has rated the wine "Prunotto Barbera d'Alba, Piedmont, Italy" from the vintage 1996 with 89 of 100 points. "Stephen Tanzer" has rated the wine "Prunotto Barbera d'Alba, Piedmont, Italy" from the vintage 2012 with 89 of 100 points. "Stephen Tanzer" has rated the wine "Prunotto Barbera d'Alba, Piedmont, Italy" from the vintage 2010 with 88 of 100 points. "CellarTracker" has rated the wine "Prunotto Barbera d'Alba, Piedmont, Italy" from the vintage 2014 with 87 of 100 points. "CellarTracker" has rated the wine "Prunotto Barbera d'Alba, Piedmont, Italy" from the vintage 2007 with 87 of 100 points. "CellarTracker" has rated the wine "Prunotto Barbera d'Alba, Piedmont, Italy" from the vintage 2008 with 86 of 100 points. "The Wine Front" has rated the wine "Prunotto Barbera d'Alba, Piedmont, Italy" from the vintage 2012 with 86 of 100 points. "CellarTracker" has rated the wine "Prunotto Barbera d'Alba, Piedmont, Italy" from the vintage 2013 with 85 of 100 points. "CellarTracker" has rated the wine "Prunotto Barbera d'Alba, Piedmont, Italy" from the vintage 2010 with 85 of 100 points. "Stephen Tanzer" has rated the wine "Prunotto Barbera d'Alba, Piedmont, Italy" from the vintage 2003 with 85 of 100 points. "Stephen Tanzer" has rated the wine "Prunotto Barbera d'Alba, Piedmont, Italy" from the vintage 2002 with 85 of 100 points. 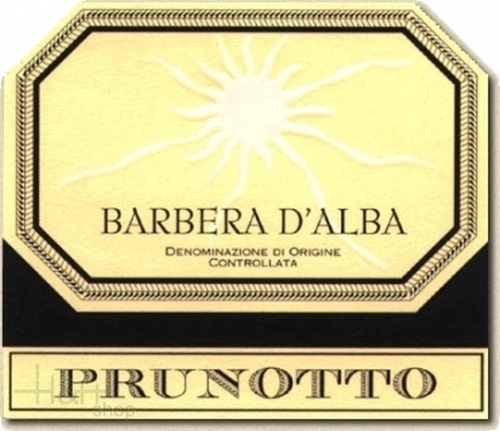 "CellarTracker" has rated the wine "Prunotto Barbera d'Alba, Piedmont, Italy" from the vintage 2009 with 84 of 100 points. Buy now this product together with Dry-Cured Ham PDO Parma sliced Levoni ca. 200 gr. Dry-Cured Ham PDO Parma sliced Levoni ca. 200 gr. ready for shipment: in stock Dry-Cured Ham PDO Parma sliced Levoni ca. 200 gr. Camembert Goat Cheese Dairy Lagunda approx. 250 gr. eatable noble mould bark, white dough with little punching; he becomes creamier with increasing maturity, aromatic taste with light hircine marks. The Goat Camembert is OGM-free and carries the quality sign for South Tirol. Coffee Espresso Lavazza Qualita Rossa 1 kg. The velvety and rich in body mixture of Lavazza coffee contains the soul of South America and the heart of Africa. San Francesco Gattinara - 2011 - Azienda Agricola Antoniolo 83,60 EUR / 111,47 €/lt. Valpolicella Superiore - 2016 - Tedeschi Fratelli 11,35 EUR / 15,13 €/lt. Chianti Colli Senesi Caelum - 2015 - Il Palagione 10,25 EUR / 13,67 €/lt. Moro Rosso - Cannonau di Sardegna - 2016 - Mesa 35,45 EUR / 47,27 €/lt. Vino Nobile Di Montepulciano - 2014 - vine cellar Ruffino 24,30 EUR / 32,40 €/lt. Torami IGT - 2012 - Tenuta Lamborghini 27,90 EUR / 37,20 €/lt. Chianti Classico - 2016 - Castello di Querceto 15,10 EUR / 20,13 €/lt. Chianti Classico Magnum - 2016 - Castellare di Castellina 47,30 EUR / 31,53 €/lt. Primitivo di Manduria Riserva DOP - 2015 - Elegia 18,65 EUR / 24,87 €/lt.